Clear Path to Power: Transparent Battery = Clear Gadgets? It would be hard to hide our enthusiasm for transparent gadgets, but for the most part the see-through things have been nothing more than concepts. That’s thanks to the innards of most gadgets being so difficult to produce in a transparent form, with the bulky battery being one of the biggest hurdles to overcome. 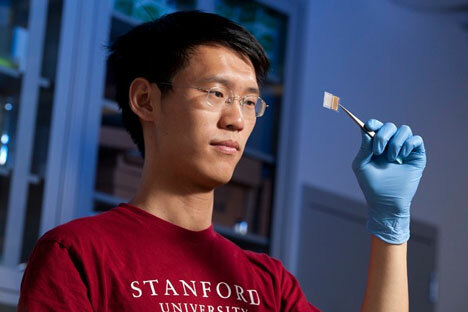 A team of researchers at Stanford University has developed a transparent lithium-ion battery that could lead to truly transparent working gadgets in the very near future. The battery isn’t actually invisible; rather, it is made up of an incredibly fine mesh of electrodes a mere 35 microns wide. That’s thin enough to appear invisible to the human eye. Currently the transparent battery doesn’t have a huge capacity; it can only hold about half as much power as a traditional lithium-ion battery. The capacity should increase as the research continues, but the battery already has the advantages of being flexible and inexpensive. See more in Energy & Power or under Science. August, 2011.